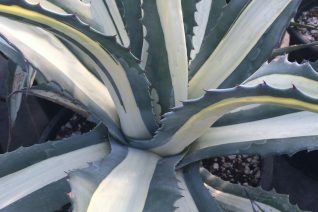 A really pretty pale blue Agave with sharp angular leaves in a remarkably symmetrical rosette with age. Cold hardy and it requires very well drained soil in a hot position. A south facing slope is ideal in soil that has been amended with liberal amounts of pumice and gravel. And you should tilt the rosette so that water does not collect in winter. This variety is a little slower than others. Aside from perfect drainage it requires a little bit of heat and patience. To 20″ tall by 30″ wide in time. Great container subject- make sure the container is sturdy and large enough to accommodate both a spreading primary rosette and prolific pups which crowd the base. In time it can form bold colonies. Move containerized plants to a dry location in winter. Remove deciduous tree leaves that collect in the rosette in autumn to stave off rot. SW U.S. High deer resistance. 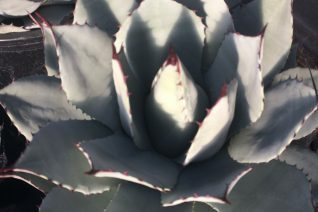 New Mexico Agave is a spike wonder. Much more upright-growing than the species with sharp-tipped leaves that terminate in a blood red thorn. OW. Forms a very symmetrical plant with many leaves of steel blue. Full sun and VERY WELL-DRAINED soil. Excellent on hot slopes where it will tilt the rosette to avoid winter wet. Pups, heh, freely and you will soon have many rosettes. Amend the soil with pumice and gravel. Make sure there is plenty of air in the soil and no place where water could collect. Fantastic specimen plant for a dry garden/gravel garden. Water through the first summer to establish then none in subsequent years. Clean out the rosette when deciduous leaves collect in there- a shop vac works great. The leaves will cause rot when they decompose….so they must go. Great in containers- large, sturdy containers. Cold hardy. High deer resistance. 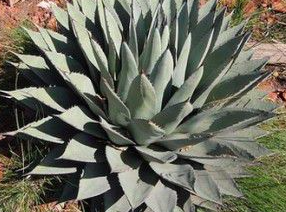 Consistently one of the most successful Agaves for gardens in our region. 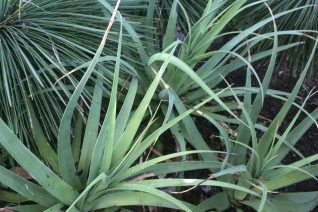 Soft gray rosettes have leaves with a distinct upright habit. At the tips of the wide leaves is a single (deadly) black thorn. Very nice. Full sun and very well drained soil with little to no summer water when established. 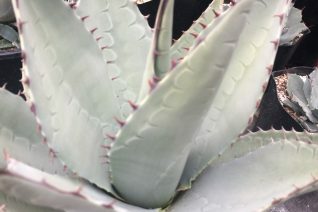 This Agave requires soil that is never soggy- amend heavily with pumice and gravel to create air pockets. 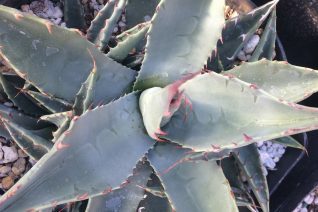 Plant this (and all) hardy Agaves in our climate on a tilt. The tilted rosette sheds rainwater and it keeps it much drier in winter. Ideally, this Agave should be sited on a hot, south facing slope. In autumn deciduous leaves from (everywhere) seem to blow into the rosette and collect. You must remove these immediately so that they do not rot the center of the plant. A shop vac works wonders…so do bar-B-Q tongs. Excellent in containers. 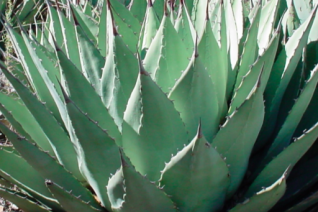 Its best to plant hardy Agaves in early spring to early summer. They require a long season to develop a tap root which in turn ensures that they are cold hardy. No tap root and not so hardy. Hardy below 0ºF when dry. Highly deer resistant.